Phoebe Boswell and the ‘Poetics of Endurance’. For the past ten weeks, Autograph has been home to one of the most visceral and remarkably dolorous, yet intimately relatable and, somehow, life-infusing exhibitions that I have seen in my entire career. Phoebe Boswell’s last body of work gathered under the title The Space Between Things awakened an entire set of emotions ranging from empathy and grief, to admiration, courage, and hope. I first encountered Boswell’s work when I was being assessed for one of my first jobs working in the African arts arena in London a year after I relocated to the British capital. I was simply asked to design a portfolio with Phoebe’s works. I remember those early works in the artist’s career, The Mechanics of Illusion series. There was something unsettling about them: the unswerving reference to a human being, in this case, like in many, the artist herself, the blurred lines, the distortion, the anguish of feeling as if being permanently in the quest for something, whatever it might be. I have followed Phoebe’s blossoming ever since; I have trusted her work to the point in which I even put my naked body to serve at her Mutumia’s militia, a project about women’s who use their bodies to protest when they are not permitted to use their voices. The Space Between Things seemed a promising show I wasn’t going to miss. Phoebe Boswell – The Space Between Things exhibition at Autograph, London, 14 December 2018 – 30 March 2019. Courtesy Autograph. I entered the exhibition as soon as I approached David Adjaye’s building Rivington Place. The architecture of the building functions as a kind of shop front window, and contrarily to what has been the layout of previous exhibitions, Phoebe’s show didn’t count with a moveable temporary wall covering the space between the privacy of the gallery and the publicly of Rivington street. 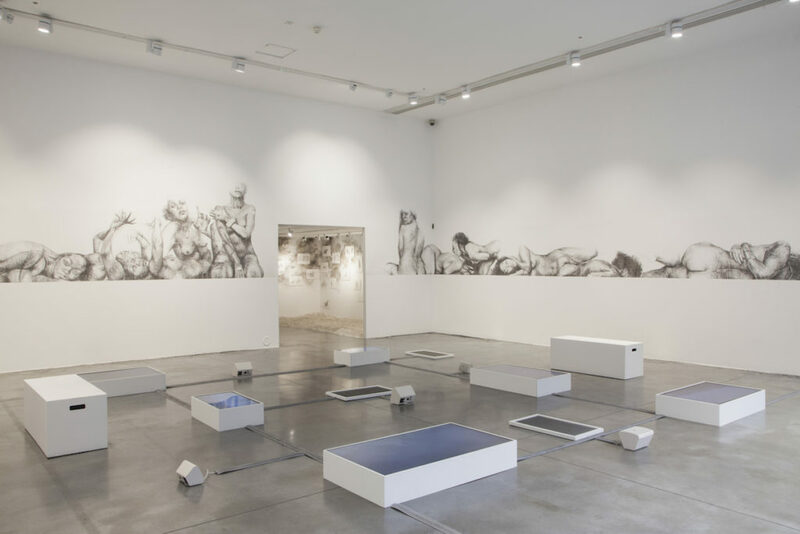 Instead, it offered a panoramic preview of an immense self-portrait of the artist in overlapping poses that travelled across of the three walls of the main gallery at Autograph, setting an imaginary line of the horizon. Once inside, I was entranced, not only for the mastery of the drawings, but rather because of the imposing, powerful, and unapologetically raw presence of the artist. The work entitled On the Line absorbed my self, making me feel minuscule. Phoebe was everywhere, looking at me sometimes, not defiantly but rather as kind of reaffirming her self; looking away some other times, contemplative, caring for and nourishing her (wounded) self. 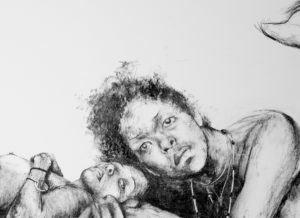 In an interview conducted by Debbie Golt, the artist manifested the importance of the use of soft willow charcoal for the mural, since its frailty resonates with that of the human body, which she addressed in the show. Boswell pointed out the non-permanent nature of the piece, and how she trusted the public to take care of it. Listening to her words made me think of our humanity; my trust, and expectancy that we are here to nurture and elevate each other; it made me think of how we continuously fail at it, but above all, of the irremediable hopeful state of knowing deep inside me how much we can succeed at it. Phoebe Boswell, 16) Phoebe Boswell, On The Line [detail], 2018 [detail], 2018. Courtesy Autograph. Phoebe’s art practice crosses over between traditional drawing, and interactive technologies in which the audience participates in signifying the piece. Indeed, accompanying her multi-layered portrait there were a series of floor-mounted TV screens distributed across the gallery presenting different scenes of her work Ythlaf. The footage displayed the artist being sweetly swayed adrift by the seawaters. A number of sensor pads that were activated by having people standing on them and released spoken word works, completed the interactive installation. She Summons an Army was the next piece as I moved through the exhibition. 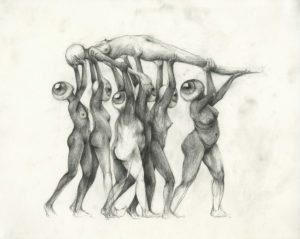 It consisted of a series of drawings on paper depicting naked women with eye-shaped heads captured in playful motion but above all, performing acts of support and care for each other. 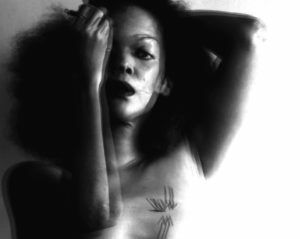 Sistren-hood and the use of the woman’s naked body as a means of power are both re-occurring themes in Phoebe’s work. The exhibition continued upstairs; if so far feelings of live-affirmation, self-reassurance, camaraderie, and care stemmed from the show, in this second part of it, Phoebe’s pain and sorrowfulness spread all over your deepest self, and heart, encroaching them. The dark and small room functions as a space where the traumatic experiences are exposed; that is the moment of physical and emotional rupture, the genesis of The Space Between Things. A black and white video showing what looks like the surgery of an eye presides the room. The footage corresponds to one of the many surgeries the artist had to undergo in order to save her right eye after an unfortunate accident at home. In the video, the surgeons are implanting donors’ cells behind Phoebe’s cornea in order to fortify it. The video is modified digitally to make the blood seem ink in reference to drawing, distinctively, the main medium used by Phoebe. On the floor there is the visualisation of an angiogram showing the artist’s broken heart, which occurred only three weeks after the accident in her eye. 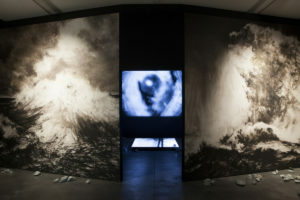 On the left, her video-work Rapture. I learnt later, it was the undecipherable sound of the artist’s voice what filled up the space; like breathing. Phoebe Boswell, film still from Rapture [detail], 2018. Single channel video. Courtesy the artist and Sapar Contemporary, New York. After observing the drawings of the sea with it’s the different tempers and moods, that escorted the room of trauma, I lead myself back downstairs to the main gallery. What a beautiful realisation was to notice tiny photographs of the Phoebe and her family at different stages of her life, attached to the walls of the staircase; those who were by her side during some of the darkes.t moments of her life. Are those ‘spaces in between things’ occupied by our most beloved ones? Aren’t they who hold our hand through our processes of healing and celebrate with us our catharsis? Back to the main gallery I let myself be nested by Phoebe’s redemption again. I realised that the images of the artist floating, are images of her healing process back to her family home in Zanzibar. I connected the therapeutic use of her Indian Ocean, to the emotional healing power of the Mediterranean Sea when I am back home, the idea of trauma that we all carry upon ourselves, our link to our most beloved ones: my parents, my sister, that are also away… I have connected previously with Phoebe’s work particularly when it has addressed notions of not-belonging, and women’s body as a mean of power, but I must admit, never to at such deep level. Extremely poetic and utterly relatable, Phoebe’s seminal exhibition has meant a place for solace and shared emotions of our most intimate selves. Born in Nairobi to a Kikuyu mother and British Kenyan father, and raised in the Arabian Gulf, Phoebe Boswell (b. 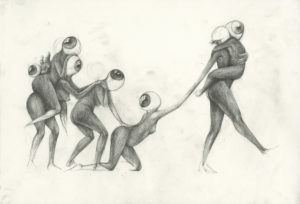 1982) is a multi-disciplinary artist who lives and works in London. Boswell studied at the Slade School of Art and Central St Martins. She is currently a Somerset House artist-in-residence, a Ford Foundation Fellow, and is represented in the United States by Sapar Contemporary, New York. 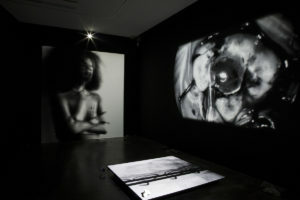 Her work has been widely exhibited: with galleries Sapar Gallery, Carroll / Fletcher, and Tiwani Contemporary; art fairs including Art15, 1:54, and Expo Chicago; and has screened at Sundance, the London Film Festival, LA Film Festival, Blackstar, Underwire, British Animation Awards, and CinemAfrica amongst others. She participated in the Gothenburg International Biennial of Contemporary Art 2015 and was commissioned to make new work for the Biennial of Moving Images 2016 at the Centre d’Art Contemporain in Geneva. Boswell was the first recipient of the Sky Academy Arts Scholarship, was awarded the Special Prize at the Future Generation Art Prize for her interactive installation Mutumia, which consequently showed as part of the 57th Venice Biennale, and has recently been awarded the Bridget Riley Drawing Fellowship at the British School of Rome. An international solo show of her work will open in February 2019 at the Goteborg Konsthalle, Sweden. Spanish-born, London-based, Raquel is a freelance arts researcher, curator, and writer specialised in postcolonial and decolonial discourses within contemporary art and craft practice. She is interested in how these resist the tendencies of globalization and how they force her to continually redefine her subjectivity in the world she inhabits. She pays special attention to the work of women artists and ideas of transnational feminisms, and how contemporary art creates spaces for dialogue. Her practice as a curator helps her to create critical situations where art, artists, and audience converse about the state of the contemporary world, generating unconventional places for understanding, sharing and creating knowledge. She tends to work collaboratively to open participatory processes that generate new inclusive and progressive artistic narratives. ← What is the Role of Art Criticism Today?